History will be made in federal parliament next week and Rainbow Families Victoria would love to be part of it! We would love to send Flis up to Canberra next week to be there for the final vote on marriage equality in the house of representatives and to represent our Rainbow Families. We've invited Jac Tomlins and Sarah Nicols to join us too and any additional funding raised will contribute towards Jason and Adrian. Sam Walsh & Annette Sparks has been fantastic rainbow families advocates in our recent trips to Canberra too - so we really want to raise enough for a one day return trip to include them too. 1. Who you are and where you’re from. 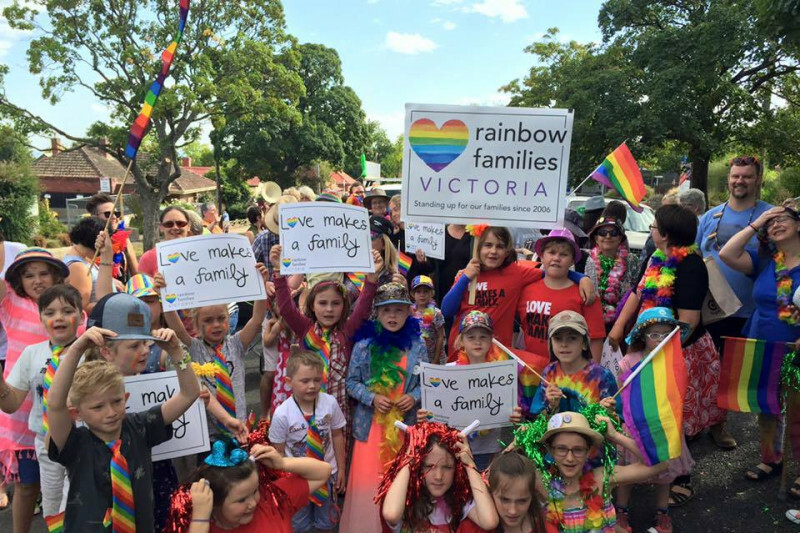 Rainbow Families Victoria advocates for LGBTIQ parents, carers and prospective parents and our children based in Victoria, Australia. We ahve a long history in campaigning for equality, against the plebiscite and the postal survey and for the rights and best interests of our children. 2. Your relationship or contact to the parties you're raising funds for. Felicity is the executive director of Rainbow Families Victoria. The remaining parties are long term rainbow families advocates who will act as representatives of rainbow families and have a demonstrated interest in, and ability to, speaking to the media on the day. All funds raised will be spent only on the cost of return flights to Canberra - up to 100% of the cost for Felicity's ticket and a contribution made towards the costs of tickets for all parties pending final amount raised. Given the limited time (based on when we think it is most likely that the legislation will be voted on) we will purchase the ticket for Felicity with the RFV credit card directly from our account and other advocates will purchase their own tickets and be refunded based on receipts presented to the RFV treasurer - Annette Sparks - within 7 -10 working days. WHY SEND FLIS, JAC & SARAH, JASON & ADRIAN? The day of the vote will be an absolute media frenzy. We have though long and hard about how to get our unique message across and how we can give our families a national voice. We believe that having Flis there will help. So too will having Jac & Sarah, and Jason & Adrian. As the two couples who accidently got the ball rolling on the whole marriage equality thing in 2004 they provide a unique message and can help break us through the 'same-old same-old' stories on the day. And of course being rainbow families will help too! We really want to be able to talk to media about the impact of equality on our children and our rainbow families - as well as our wider LGBTIQ communities - something we are not sure will happen without us. We also want to talk about why the Bill as it stands - and any yucky additional amendments are looking less likely by the hour - is a massive compromise for the LGBTIQ communities. Rainbow Families Victoria endorses the Greens amendments to improve the bill and strip it back to remove any further discrimination but it is becoming clearer that these will be unsuccessful. We want to be able to highlight the struggles still facing our rainbow families and to also thank the politicians personally who have fought for the reforms for so long. We believe we have a unique prespective on marriage equality to - giving our families legal certainty - an, by having Jac and Sarah, Jason and Adrian, there too we can reienforce this message. And we would also love to see rainbow families represented in Canberra on this historic occasion. Our families – our friends and allies – have played an enormous part in this campaign. Last year, our kids travelled to Canberra to lobby politicians and they did a fantastic job. Since then, they’ve marched and spoken and written letters and had conversations with their teachers and friends at school. This is their day too. Can you help us make sure Flis, Jac and Sarah and Jason and Adrian, and Sam and Annie are there next week representing rainbow families are in parliament to witness herstory? Any donation big or small will be gratefully received. Thank you for your continued support of Rainbow Families Victoria. A bill to establish Marriage Equality in Australia is due to pass our Federal parliament in the coming weeks. The Senate will debate the bill this week and have committed to sit until it passes, with or without amendments. The bill will then go to the House of Representatives for further debate which could take another week or more. The Government has committed to passing marriage equality by Christmas. Watch this space! Help Rainbow Families Victoria witness marriage equality next week. It is never easy to ask for money but we do like to think we have paid pretty good dividends on your contributions in the past and hope you feel the same! We have re-launched our new GoFundMe call out to include the cost of a one day return flight for me as well as Jac, Sarah, Jason and Adrian and also towards Sam and Annie coming along too. Our updated GoFundMe proposal aims to ensure you as our supportive community understands why it is important to have rainbow families represented when marriage equality happens. We believe Rainbow Families Victoria has played a huge role in securing marriage equality and we want our voices to be heard next week in Canberra. Your donations, not matter how small, will help us get there just for the day and will make a difference. Thank you as always for all your continued support of rainbow families everywhere.